been reported to have been leaked with the winner to be Lionel Messi not Cristiano Ronaldo. 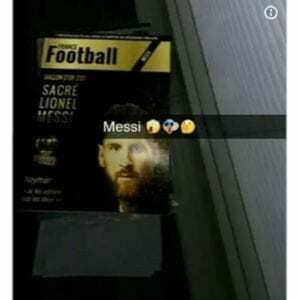 SportBible have reported a picture of a French magazine’s December cover with Messi on the front suggesting that the Argentine will beat Ronaldo to the number one spot in three weeks time. If this was to be correct it would sure to be a controversial one with many having tipped Ronaldo to instead take home the illustrious award after another glorious and decorative season with Real Madrid. The Portuguese star sealed both the Champions League and the La Liga title this year while Barcelona’s Messi could only watch on. This year’s Ballon d’Or winner has been apparently leaked with Lionel Messi set to win the award not Cristiano Ronaldo. Further, Messi very nearly missed out on qualification for next year’s World Cup with his national side Argentina with the little magician having to produce a spectacular hat-trick on the final day of South American qualification to allow his national side to narrowly scrape through to the tournament being held in Russia next summer. The Barcelona number ten has won the prestigious Ballon d’Or award an astonishing five times (more than any footballer before him), while Ronaldo is one behind on four. If Ronaldo was to clinch this year’s award he would of-course level the amount of awards one between himself and Messi to five. However, if the reports are correct then Messi will continue to break records with his sixth Ballon d’Or leaving Ronaldo two behind. We will have to wait with baited breath to see if these rumors are true but the Ronaldo fanboys are sure to be unhappy with the news.